On March 13, 2012, Derek Hough, beloved three time winner of “Dancing With The Stars”, launches DerekHough.com, his interactive hub of activities online, it was announced today by EQAL, the next-generation media company that combines technology and people to power 24/7/365 digital media properties around consumer brands and celebrities. The site is the ultimate community for Derek and his fans to congregate and communicate about what’s important to them and for Derek to share his reflections on the week – at work and at play. DerekHough.com is the destination for fans and art-lovers alike to get an inside look into the life of the dancer, artist and entertainer. The site showcases Derek’s passion for art, music, photography and everything else within the creative realm and aims to inspire others to follow their similar creative aspirations with engaging giveaways, contests and user-generated content. 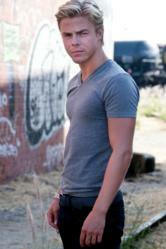 DerekHough.com incorporates Derek’s Twitter, Facebook, YouTube and other social media applications to make it the ultimate center of activity for Derek. Comments from fans add to the multi-dimensionality of the site and they can upload their own photos and videos as a part of the Derek Hough community. A multi-talented entertainer and three-time, Emmy nominee, Hough recently took a season off from "Dancing with the Stars" to film his first feature film starring role for director Duane Adler and producer Robert Cort in Cobu 3D: New York Nights. Hough also performed in London's West End where he starred as the male lead in the critically acclaimed stage version of Footloose, was one of the featured dancers on the Dancing with the Stars Tour and a choreographer on the BBC (UK) hit show, "Dance X." With celebrity partners on "Dancing with the Stars" that have included Joanna Krupa, Lil' Kim and current host Brooke Burke, Shannon Elizabeth, Jennie Garth, Ricki Lake and recent champions Nicole Scherzinger and Jennifer Grey, Hough is best known for his innovation and daring choreography on the show. His work has brought him Emmy nominations and inquiries from the film and music world regarding his dance knowledge and ability. In addition to choreographing the hit music video “Parachute” for British popstar Cheryl Cole, Hough performed live with her on her 2010 concert tour in England and France to rave reviews and standing ovations. Hough’s professional ballroom accolades include, World Under 21 Latin American Champion, Two-time Open British Champion (Blackpool), Two-time International 'Open to the World Champion' and Two-time US Open Champion. EQAL is a next-generation media company that combines technology and people to power 24/7/365 digital media properties around consumer brands and celebrities. An EQAL media property is a multiplatform digital magazine that creates a seamless experience for fans across various devices and social networks. With over 25 media properties, including Nick Cannon, Bethenny Frankel, Elizabeth Banks, The Kind Life with Alicia Silverstone, Stan Lee, Tori Spelling, Lauren Conrad, Sugar Ray Leonard, Bella Thorne, Michelle Phan, KRAFT’s Real Women of Philadelphia, Walk With Walgreens, and YouTube phenoms Elle & Blair Fowler, our network reaches more than 30 million trend-setting consumers and generates over 3 billion content impressions every month. EQAL was founded by online programming pioneers Miles Beckett and Greg Goodfried who created many of the "firsts" in the development of the online video industry with lonelygirl15, KateModern and Harpers Globe. In April, EQAL will premiere u look haute, one of the YouTube original programming channels.